en SEDATIVE AND ANXIOLYTIC EFFECTS OF THE EXTRACTS OF THE LEAVES OF STACHYTARPHETA CAYENNENSIS IN MICE. 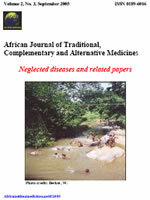 The leaves are used ethnomedicinally in Nigeria and other parts of the world for insomnia and anxiety among other uses. The investigations sought scientific evidence for the ethnomedicinal use of the leaves for the management of insomnia and anxiety as well as the neural mechanisms for the activities. The sedative and anxiolytic effects of the extracts of the leaves of Stachytarpheta cayennensis were examined in this study. The methanolic extract (5-50 mg/kg, i.p.) as well as the ethylacetate (10-50 mg/kg, i.p. ), butanol and aqueous fractions (5- 50 mg/kg, i.p.) of the extract were examined. Sedation was assessed as reduced novelty-induced rearing (NIR), reduced spontaneous locomotor activity (SLA) and increased pentobarbitone-induced sleeping time (PIST) in mice. The anti-anxiety effect (methanol 2.5-5.0; butanol 5.0; aqueous 20.0; ethylacetate 25.0 mg/kg, i.p.) was assessed using an elevated plus maze. LD50 was calculated for the extract and the fractions after the intraperitoneal route of administration using the Locke method. The methanolic extract, the butanol and the aqueous fractions inhibited rearing and spontaneous locomotion but prolonged pentobarbitone induced sleep. The ethylacetate fraction however increased both rearing and locomotion and decreased pentobarbitone sleeping time. The butanol and aqueous fractions, but not the methanol extract showed indices of open arm avoidance consistent with anti-anxiety effect. Naltrexone (2.5 mg/kg, i.p.) reversed the inhibition of rearing, locomotion and prolongation of pentobarbitone sleep due to the aqueous fraction of the extract. Flumazenil (2mg/kg, i.p.) abolished the effects of both methanolic extract and the butanol fraction on rearing, locomotion, pentobarbitone sleep and anxiety model. The methanolic extract, the butanol and aqueous fractions possess sedative activity while the ethylacetate fraction possesses stimulant property. The anxiolytic effect was found in both the aqueous fraction and the butanol fraction but not in the main methanol extract and also not in the ethylacetate fraction. Flumazenil, blocked the effect of the leaves of Stachytarpheta cayennensis on rearing, locomotion and elevated plus maze suggesting that GABA receptors are involved in the observed sedative and anxiolytic activities. This study also found opioid receptors involved in the sedative activity of the leaves of Stachytarpheta cayennensis. The rationale for the ethnomedicinal use of the leaves for the management of insomnia and anxiety were confirmed scientifically in this study.